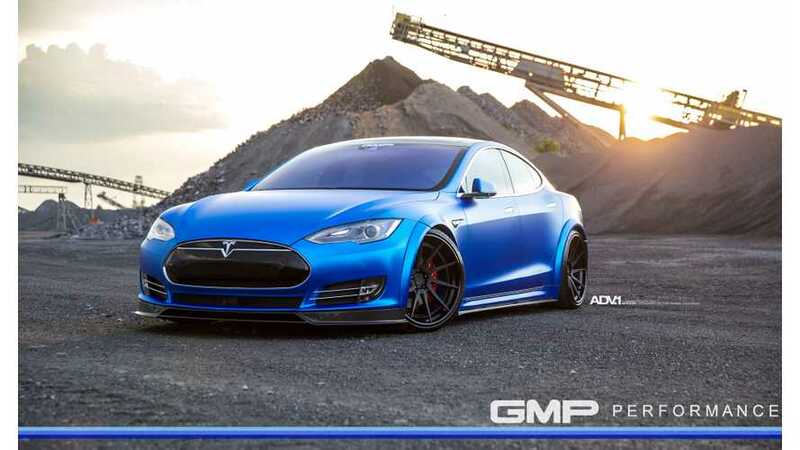 Tesla Model S might not be the first thing that pops to mind when aftermarket builds enter the conversation. But in reality, the vehicle benefits greatly from such additions. The same principle is true in the case of this vehicle. While the clean & striking matte blue wrap may be the most impactful aftermarket touch, this Model S P90D features a bit more than that. It comes with several carbon fiber additions and the vehicle has been lowered, resulting in a much more aggressive stance. Finally, a set of aftermarket ADV.1 Wheels was installed, adding that perfect finishing touch to this build. Placed just under the range-topping Model S P100D, the P90D is a great combination of luxury, range, and ultimately, performance. When coupled with a Ludicrous Speed upgrade, the vehicle relies on 525 horsepower and 713lb-ft of torque, allowing for a mind-numbing acceleration from 0-60mph (0-100km/h) in just 2.8 seconds. Some would say this is a perfect foundation for an aftermarket build. And we tend to agree. This Model S is tuned by GMP Performance, a North Carolina based tuner that specializes in high-performance and luxury vehicle builds. It features a pristine matte blue wrap, accentuating the curvaceous lines of the Model S perfectly. This is followed by a set of RevozSport carbon fiber additions. These consist of a carbon fiber front lip spoiler, a set of sideskirts, a rear diffuser, and a rear decklid spoiler. In all, these dark carbon fiber make for a perfect contrasting effect against the matte blue exterior. The final touch is a set of ADV10R Track Spec CS Series wheels. These lightweight three-piece forged wheels are custom built for each application. Thanks to a directional ten-spoke design, they give the Model S P90D an aggressive & gorgeous exterior look. The wheels on this battery-powered beast come sized 21x9.5 and 21x11 in the front and rear. They feature a Fine Textured Black finish, combined with Gloss Black finished lips. The inner wheel barrels feature a Brushed Matte Blue finish. The same is applied to the 50/50 Exposed Hardware option - matching that of the vehicle, and giving this Tesla Model S P90D quite a unique look. You can grab a detailed look at this build right below.